I'm resurrecting my blog after much time away. The last year has been filled with activity, creativity, and some unexpected responsibilities. I'm feeling it's time to share what's unfolding, changing, expanding. I'm finally back into a flow that allows for the kind of writing, creating and sharing that is not directly tied to projects and schedules. And so, I welcome myself back to the blogger universe! I'm right on schedule for when I projected I'd begin again. You know that old promise... "after the first of the year". There is, of course, the trembling terrors that I'll start again and fall away again. But, then, trembling terror has never stopped me from risking another try. With this renewed flow I begin again to create more balance in my life. Or, perhaps, I've stopped the faulty thinking that I had no balance in my life. I feel like I've landed back in my body and in the present. I've recently been reading Jon Kabat-Zinn's book, Coming to Our Senses. It's a book on his work using mindfulness meditation for stress reduction. He mentions a quote, I think by Soen Sa Nim (of course, I can't find it now!). But it goes something like this, "If you make a problem, then you have a problem". So, maybe we can unmake the problem of thinking we have no time or balance. Because certainly if we make the problem - saying it's a problem makes it one - we can unmake it and return to .... no problem. Yesterday, Ken took down most of my old website and put up the placeholder I created. I'll be working on a new look and including new art. In the blog I'll be including samples of new writing. 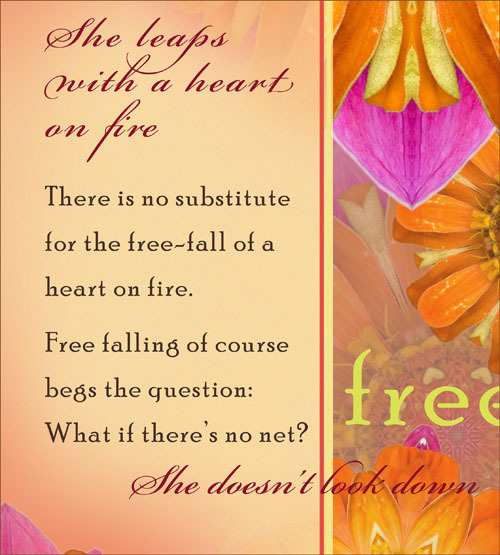 Writing is still a big focus for me - A Fearless Woman, the book, and other new titles in the works. I've expanded the greeting card collection for Calypso - it's doing really well with 21 cards in the line now, including new Holiday styles out this year. This is a new card coming out from Calypso based on the 2011 calendar art for A Fearless Woman. On the back it says "from the series, A Fearless Woman - A profile of passion and resilience". This makes me HAPPY! Just finished the new art for 2014 calendar products for Brush Dance and thinking about 2015. 2013 will be out summer of 2012. The 2012 date book sold out so if you're getting attached to the Fearless Woman story order early. The 2013 and 2014 are returning to the 2011 format. Each page has writing based on a particular profile:. 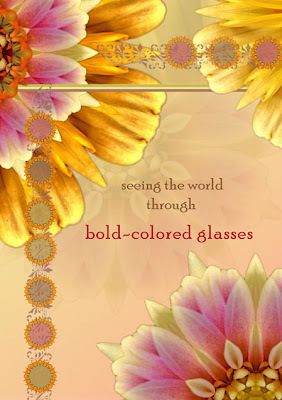 "She sees the world through bold-colored glasses", "She rises beyond all limits", "She dances...etc. I'm really, really happy with the new art and writing and the most beautiful products that Brush Dance produces. HAPPY! The line of classic Goldenflower Studio cards (launched originally in 2003) and now (since 2011) distributed by Collage is selling great. I'll add some new cards for spring/summer. 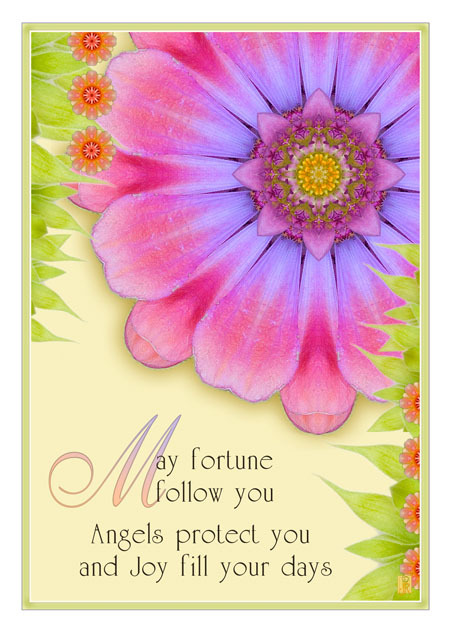 This card came out last year in the Goldenflower line distributed by Collage Greetings. It's been one of the top cards in this line. It's blank inside - gets used for everything from birthdays to weddings. All of these seeds planted or replanted in recent years, fed and nurtured, and now growing and flourishing. And, I'm seeing the potential for new partnerships on the horizon for licensing my writing and art. I'm working on new titles for calendars and other products. I have new illustrations of art and words I'm really excited about. I'm beginning again to send new work out into the world after a little hiatus. And, again, I feel the old trembling terrors of having life become overwhelming and losing my way with my objectives, my schedule, my dreams. But still.... what are you going to do but get on with it. "If you make a problem, you have a problem." Till the next time.... May joy fill your days.